Gullible. Yep, that’s me. Seriously, I believed that Victoria was dead. What’s the matter with me? This is “Revenge,” and we all know too well that anything is possible! What a sucker I am! Emily is near the end of her journey with lots’s of casualties along the way. Of course there is one in this episode, we’ll talk about that later. 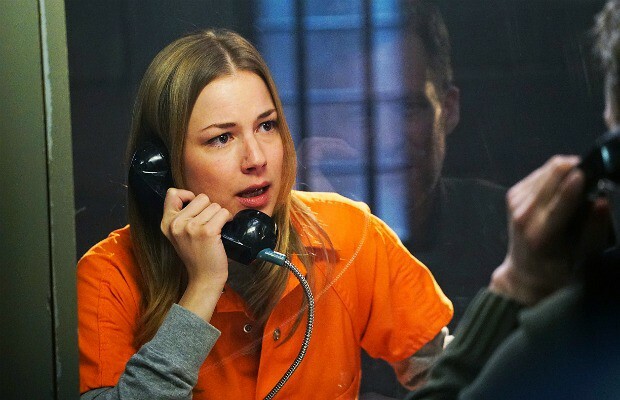 Emily is in jail, not looking like her usual self. She shows some stress and is bound to clear her name, even though the prosecutor is going after her for first degree murder. Ouch! Her attorney tries to convince her to take a deal, but no can do. Our Emily would never do such a thing. The judge sets bail, but with very strict rules, including an ankle bracelet keeping her in her home (better than a cell), and a stern lecture. Ho hum, she thinks to herself. “I have people to see, schemes to plan…” (She would say). Guess who tries to get in her way? Ben. He seems hell bent on getting her convicted. I wouldn’t want to be his ex. Troops reunite – Nolan, Jack and dear ole dad. Emily “knows” Victoria is alive (as I said, I didn’t) and needs to find Mason. Nolan tracks him to a trailer park. Emily says she’s going after him – the little weasel that he is. Before she leaves to find Mason, she and Jack have a very poignant conversation. She admits to him that she tried to stop him at the airport and wants to try things out when everything is over. Okay, really? I know not to get excited because something will happen to mess this up, right? Just like Nolan interrupted what was going to be a kiss between them! Nolan! David, who gets more tired every day due to his treatment, finds out Emily is going after Mason and tries to put the breaks on her idea. He tries the old “I’m your father…” speech, but to no avail. There is no way Emily is going to let anyone stop her. Nolan figures out a way to copy her ankle bracelet signal so that the police think she’s still at home… unfortunately, she gets caught (are we all on the side of a vengeful woman who has caused so much upheaval and many deaths? I think so. ), but only after a neighbor at the trailer park confirms that Mason and a regal looking women left in a hurry a few hours ago. Emily is hauled back to jail. I thought it was fitting that Jack was the one who noticed the license plate of the town car that dropped off Mason – Margaux’s town car. Well well well. As much as I love the actress (Karine Vannasse) that plays Margaux, I’m glad she was caught. What are the odds that Emily and Margaux have cells side by side? They are really good on this show! Lol. Emily tries to intimidate Margaux into telling her where Victoria is. Margaux is not happy and a little scared – as she should be. After Emily tries to tell Ben that Victoria faked her death by using an unclaimed body, her own blood, and help from Mason, he decides to check things out for himself… bad idea. 1. Ben finds where Victoria is hiding out and confronts her, only to be stabbed (and I’m sure killed – another one bites the dust) in the back. Is “Revenge” really going to end this way? Will almost everyone be dead, including David? Will at least Emily and Jack get together? What about Charlotte? She had a small part in the episode, making it clear to Louise that she doesn’t give a rip that Victoria is dead. Okay everybody, what’s your guess? How’s this show going to end? As we know by now, anything can happen – and probably will! Margaux looks obsessed; maybe she and Emily can team up if they are the last standing.